In Studio Sessions, our ongoing web series, the 15 artists in the Walker-organized exhibition Painter Painter respond to an open-ended query about their practices. Here New York–based artist Joseph Montgomery discusses how 3D modeling — both actual and virtual — influences his thinking on exhibition making. My day jobs during and after graduate school were always in the art handling, exhibition design, and fabrication fields. I had the opportunity to work for an array of employers in the art world, both commercial and nonprofit, laying out and installing exhibitions. This taught me about the exhibition process and timeline for artwork after it leaves the artist’s studio. One specific lesson from these jobs was that digital visualizations of gallery spaces could increase communication by better engaging the artists, curators, art-handlers, and fabricators throughout the installation. 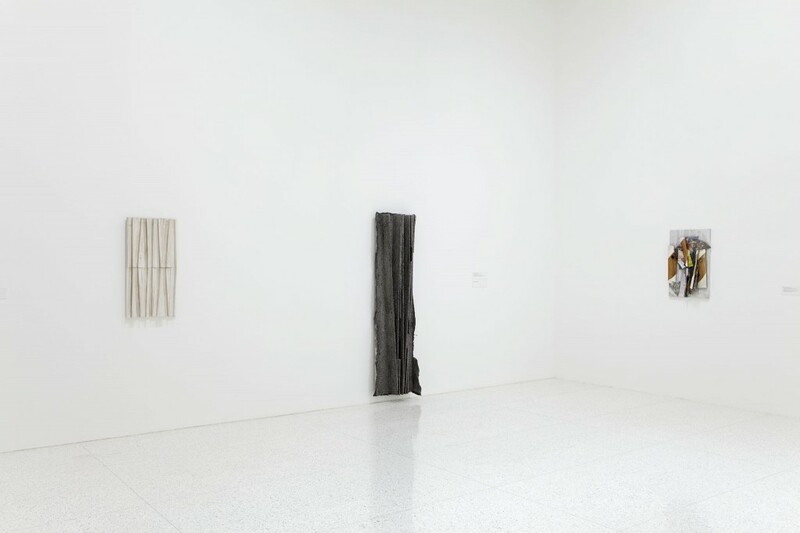 It is common practice for institutions to create visual prototypes or surrogates of both space and art. 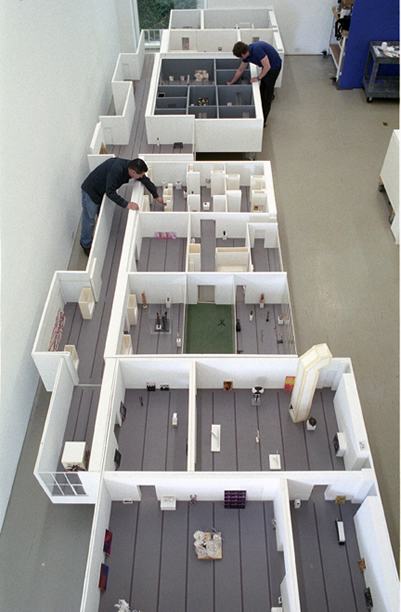 Museums often use foamcore models – as the Walker, SFMOMA and the Getty do – although some create more permanent models (the Menil Collection in Houston, for instance, created models complete with periscopes to view the miniature galleries at eye level). The process of laying out the shows, moving artwork from wall to wall, is deeply satisfying. 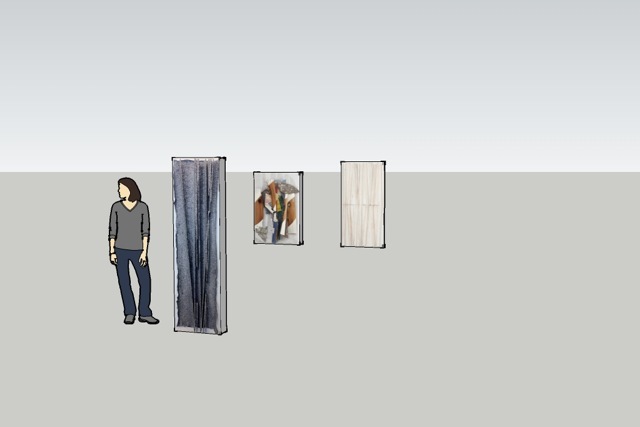 To further explore the potential iterations of an exhibition’s design, I began using Google’s 3D rendering software, SketchUp, on a repeated basis. 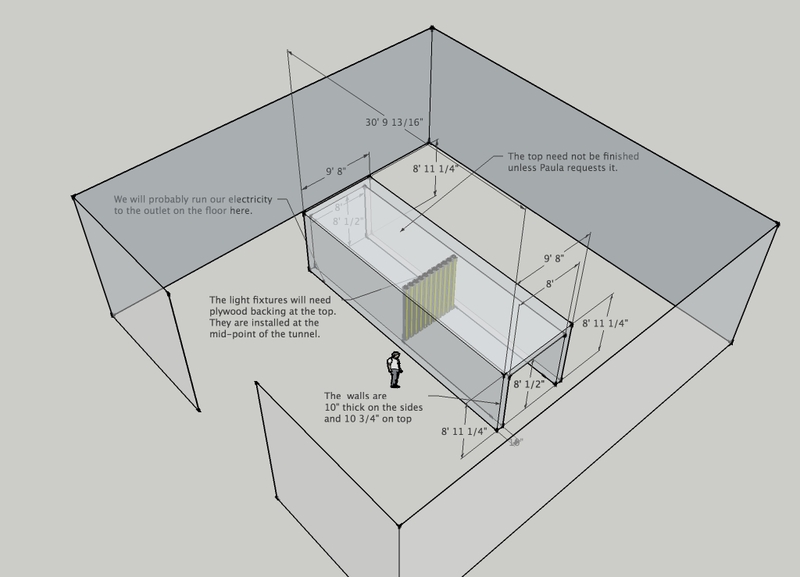 Such digital layouts of a space can be both helpful and absurd. One of the reasons I make paintings the way I do is to render a representation of abstraction. This reasoning extends to the titling of the finished painting: “Image” + a number indicating its place in the progress of the studio project. Interestingly, the painting is least like itself when it is photographed: dimensions are flattened, textures are approximated as pixels. These transformations complete the image but question the veracity of the representation. The photographic image creates expectations or assumptions about the object. 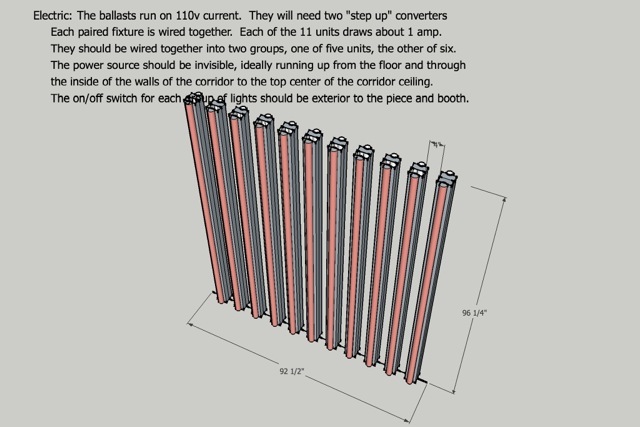 3D rendering plays with both functions; a flat image stuck on a 3D rendering of a box poorly describes a physical interaction with the work, but it is also useful. It is sufficient with nearly the least amount of information, and that economy is satisfying to me and amusing, much as the layering and materials of a physical collage are disguised and poorly rendered by a photographic image and yet the flat photographic image is assumed to be the pinnacle of description. 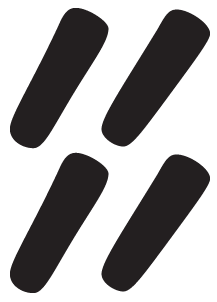 WhitneySketchupAnimation from Joseph Montgomery on Vimeo. 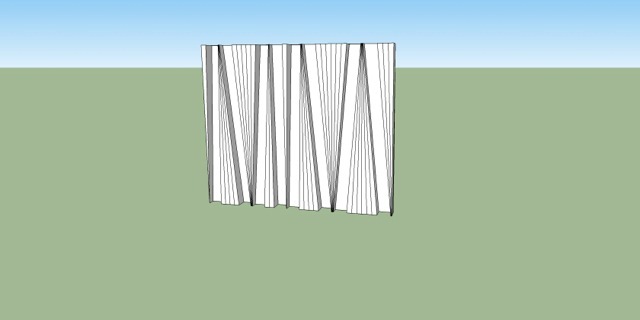 As my exhibition opportunities have grown and I no longer work for anyone but myself, I have begun using SketchUp as personal layout tool. For my recently opened exhibition Five Sets Five Reps at the Massachusetts Museum of Contemporary Art, I have measured and built the digital version of the Brown Gallery, which is in the northeast section of the museum campus. Here are three animations, the most recent layout being the last animation. 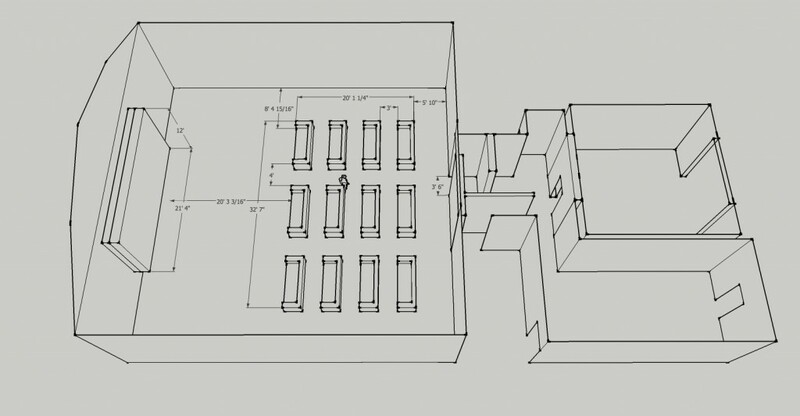 MASS MoCA Sketchup Version 1 from Joseph Montgomery on Vimeo. MASS MoCA Sketchup Version 2 from Joseph Montgomery on Vimeo. MASS MoCA Sketchup Version 3 from Joseph Montgomery on Vimeo. As you can see from these layouts, I like to mix the types of work together. 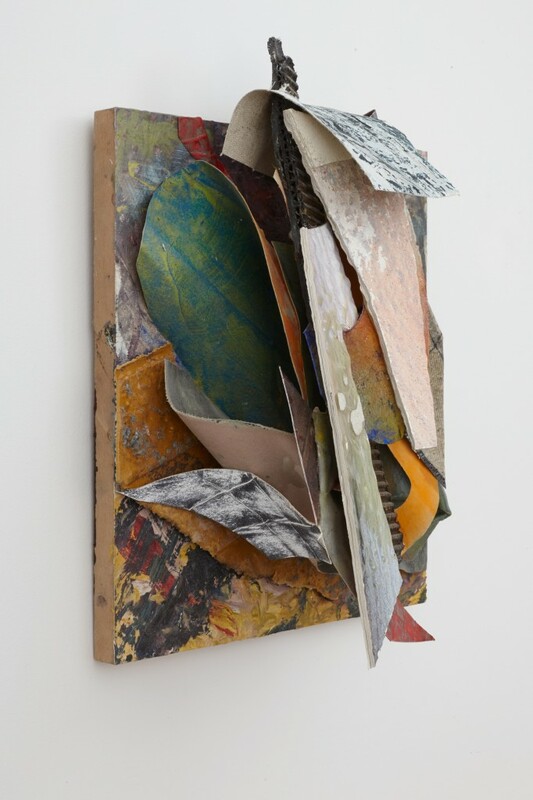 While we could have laid out the show categorically (shims, collages, canvases, cardboards) and segregate the galleries by type, we instead decided to communicate the fact that each genre’s process, forms, and materials overlap. The differences in the genres exist because there are myriad ways of constructing an image that represents abstraction. I use the processes that both originally excite me and precipitate from progress in the studio. We intend Five Sets Five Reps to provide not a timeline but the paintings in context with each other as fluid catalysts. 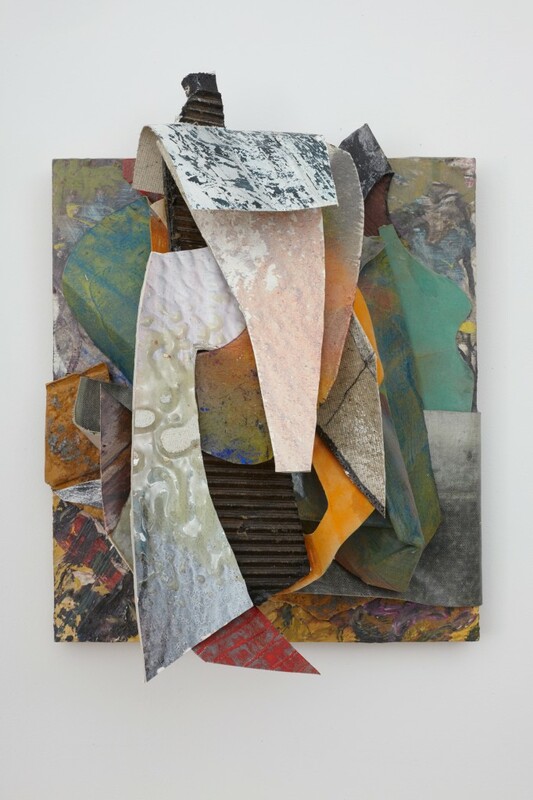 The three pieces at the Walker are a miniature version of this kind of installation: three different iterations of the wedge, the shim, play roles in the assembly of three different abstract images. When I make a 3D version of one of my pieces, I usually just make a rectangular box of the same dimensions and depth and stick the flat image on top of the box. In the end, the physical movement of the work throughout the gallery space of MASS MoCA trumped any sort of digital planning. You can see in the installation shots below that not much of the digital starting point remained. 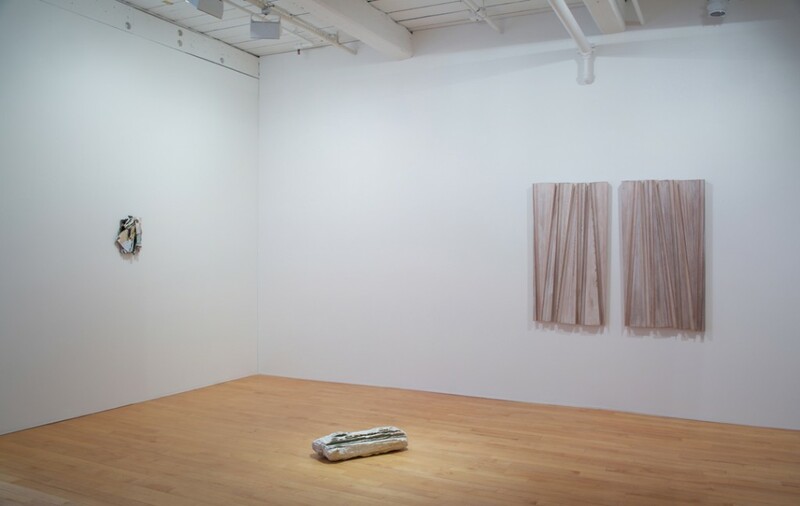 The long views from gallery to gallery, the color of the floors, the change in lighting from the windowed room to the halogen bulb–lit rooms all modified what paintings functioned adjacent to each other and what paintings did not belong in the show at all. 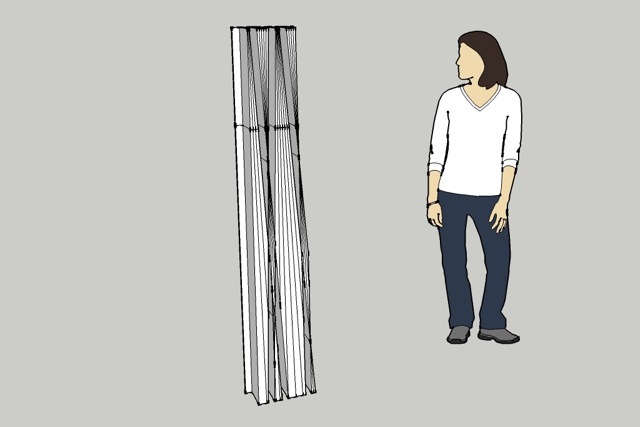 While somewhat quixotic, the SketchUp model still has longevity for my studio practice. I look at it occasionally not as folly but as an interactive relic of decision making. It is very much like collage; the parts are moveable. 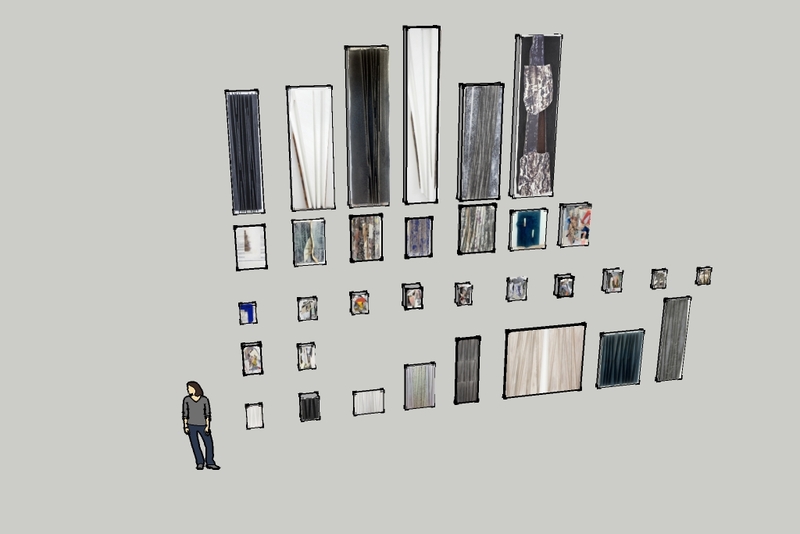 If any reader would care to, here are the files that would allow you to install your own version of my show at MASS MoCA: paintinggrid.skp, sketchupmassmoca.skp.